SAORINOMORI has a branch in Ikebukuro, Tokyo. 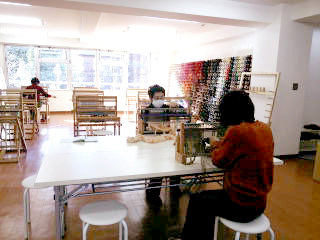 You can explore SAORI Weaving in the one-day visitors’ class. 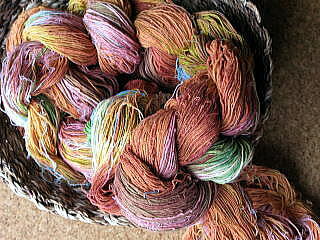 Yarns and equipment are also available for sale. Intensive classes in English are not available in Tokyo. Please come to SAORINOMORI headquarter in Izumi, Osaka (See http://www.saorinomori.com/eng/en_class.html) for intensive classes in English. You can just pick up the weaving threads you like, and start weaving immediately on a pre-set warp. In 3-4 hours, you can weave your first shawl. We have a variety of widths of pre-set warps. You can take one-day visit class as many times as you like. Fees: JPY1,000 + Material (JPY10/g) per day per person *8% consumption tax is to be charged separately. No reservation is necessary, if your group is smaller than 5 people.